Simon has lived in Manchester for 7 years now, having moved here to study at the Royal Northern College of Music. Last year he got married to his beautiful fiancée Naomi and is enjoying a busy and varied career as a trombonist, musical director and teacher. 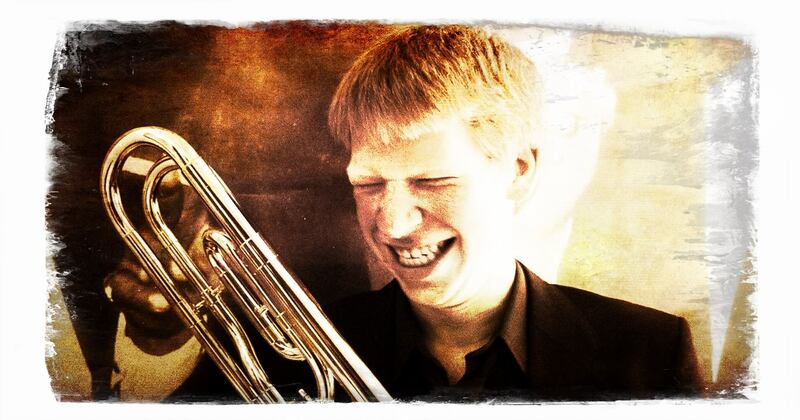 At the RNCM Simon studied the classical trombone with Christopher Houlding and Roger Cutts and jazz trombone with Jiggs Whigham and achieved a first class honours degree, having lots of fun in the process. Simon is a member of the multi-award winning Beats & Pieces Big Band who are in demand on the European jazz festival circuit as well as well as here in the UK including several recordings for BBC radio 3’s Jazz on 3. Simon was delighted to be appointed as MD of the Wychcraft Big Band in August 2012 and is having a great time making the world’s best music with them, that of the Big Band.